Gov. Jerry Brown listened. After residents, local officials and activists criticized his administration’s excruciatingly slow pace in cleaning up lead-tainted homes near the shuttered Exide plant, the governor has stepped up with a proposal to spend $176.6 million to test and decontaminate affected properties within a year. Brown’s plan, announced Wednesday, calls on legislators to approve an immediate loan from the state’s general fund to cover the projected cost of the work. Senate Pro Tem Kevin de Leon and Assembly Speaker-elect Anthony Rendon said their chambers would introduce emergency legislation next week. The proposed funding is more than twice the $70 million that Los Angeles County Supervisor Hilda Solis and community groups requested last month. They were hoping for enough money to test all 10,000 properties in the impacted areas for lead contamination and to begin cleaning the most tainted properties. But with $176.6 million, state Department of Toxic Substances Control officials say they could hire enough crews to test every house and clean up 2,500 homes, schools, day care centers and parks within 1.7 miles of the former battery recycling plant. The hope is that the money will cover most, if not all, the properties found to be contaminated. The funding is considered a loan because the state intends to try to recoup the expense from Exide later. The governor’s urgency and the DTSC’s new aggressive cleanup schedule is welcome news. Residents in Boyle Heights, Maywood and other communities near the plant have been living in fear since state officials warned last year that their yards and homes might be contaminated with levels of lead high enough to cause learning disabilities and behavioral problems in children and miscarriages in pregnant women. People were told to keep their children from playing in the dirt and to avoid eating fruits or vegetables that touched the soil. Yet, despite the urgency of the warnings, state officials moved glacially to assess and remove the risk. As of last month, the state had cleaned up only 191 properties, which is a tiny fraction of those affected. The slow pace was frustrating to residents and local elected officials in the working class communities near Exide who watched Brown and his administration’s swift reaction to the natural gas leak near Porter Ranch, an affluent suburban neighborhood. It was especially galling because the state bears some responsibility for Exide’s contamination â€” it allowed the plant to operate on a temporary permit and outdated pollution controls for 30 years, despite repeated air-quality and hazardous-waste violations. DTSC officials downplayed comparisons to Porter Ranch, noting that Exide is one of the largest cleanups of its kind in the nation and insisting that it took time to develop a realistic price tag. The total cost per property is expected to be roughly $45,000. Brown’s proposal would also exempt the cleanup from the California Environmental Quality Act, which means DTSC officials would not have to complete a lengthy environmental impact report before removing lead-laced soil from all homes. However, state officials said they would â€” and they should â€” work with the community to reduce potential harms from the cleanup, including noise and exhaust from trucks and heavy construction equipment. The governor’s proposal also includes funding to improve community outreach on Exide-related health concerns, and it calls for the state to hire local workers and contract with local businesses for the cleanup. This is a good start to make amends for decades of neglect. Brown and lawmakers have said Exide is a priority and now they are beginning to prove it. February 17, 2016 , 2:58 p.m.
Gov.Â Jerry BrownÂ on Wednesday called on the state to spend $176.6 million to speed up the testing and cleanup of potentially thousands of lead-contaminated homes surrounding a shuttered battery recycling plant in Vernon. The move would mark a significant boost to a massive effort to test and clean homes, schools, day-care centers and parks around the Exide Technologies facility that is expected to cost hundreds of millions of dollars. Residents in the working-class Latino communities around the plant have complained for years about the pollution and criticized government agencies as slow to deal with the problem. The funds, which the state would seek to recover from Exide, would be paid over the next year to test 10,000 homes within 1.7 miles of the closed plant and to remove lead from about 2,500 homes where levels pose the greatest risk of poisoning, said Barbara Lee, director of the Department of Toxic Substances Control. The testing would be done in Boyle Heights, East Los Angeles, Commerce, Bell, Huntington Park and Maywood. â€œThis is clearly the largest cleanup the department has ever undertaken,â€ said Lee. The $176-million amount, which would require approval from the Legislature, was based on the department’s estimate that 20% to 25% of homes in the area may have lead levels high enough to be given highest priority for cleanup. Exide agreed to shut the plant last March under a deal with federal prosecutors. To avoid criminal charges, the company agreed to be responsible for the full cost of cleaning the lead contamination. But the cleanup has not proceeded quickly or smoothly. 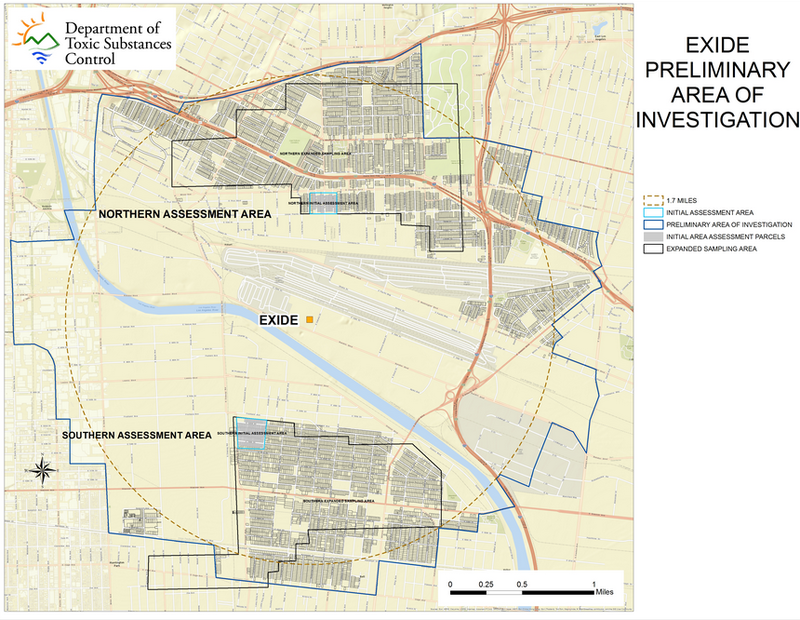 Since detecting lead contamination in the soil of homes around Exide two years ago, the state Department of Toxic Substances Control has tested about 500 homes and cleaned up about 195. The department pledged $7 million for cleanup and testing last year, and Brown later proposed adding $8.5 million. But lawmakers and community groups said that commitment was woefully short of the amount needed to deal with a serious health risk. â€œWith this funding plan, we’re opening a new chapter that will help protect the community and hold Exide responsible,â€ Brown said in a statement Wednesday. An Exide spokeswoman did not immediately comment on Brown’s proposal. The Exide plant melted down and recycled used car batteries, releasing lead, arsenic and other harmful pollutants into the air while the state allowed the plant to operate for decades without a full permit. Years of air pollution from the facility left behind lead dust, a toxic metal that can cause learning disabilities, lower IQs and other developmental problems â€” even at low levels â€” with children and pregnant women at greatest risk. Brown’s proposal was praised by local officials, state lawmakers and community groups, all of which had intensified criticism of the state’s commitment to help Southeast L.A. County communities at a time when it was responding vigorously to address health effects of the gas leak near the wealthy neighborhood of Porter Ranch. â€œGov. Brown has sent a message that environmental fairness and equity is a fundamental value no matter where you live or how much you make,â€ Assemblyman Jimmy Gomez (D-Echo Park) said. Huizar called the money a down payment on the total amount needed to remove the lead. Each contaminated home costs about $40,000 to clean, according to the toxic substances department. The funds would be a supplement to this year’s budget and would be lent to the toxic substances department from the state’s general fund. â€œHowever, cleanup costs initially incurred by the state will ultimately be sought from the parties responsible for the lead contamination,â€ according to a letter Wednesday from the state Department of Finance to lawmakers. The cost recovery would be based on tests the state would conduct to â€œconclusively identify the source of the contamination and hold Exide â€” and any other responsible parties â€” accountable,â€ the letter said. Senate President Pro Tem Kevin de LeÃ³n (D-Los Angeles) told reporters during a conference call that he would introduce legislation to expedite delivery of the money. De LeÃ³n blamed the cleanup delays partly on incompetence at the toxic substances department. And like other state officials, he addressed questions about why the state and taxpayers should carry the immediate costs rather than Exide. â€œWe still have to do more,â€ she added, noting that the full cleanup could cost in excess of $400 million. Times staff writers Patrick McGreevy, Melanie Mason and Emily Alpert Reyes contributed to this report. After years of silence, Gov. Jerry Brown Wednesday asked California state lawmakers to spend nearly $177 million for expedited testing and cleanup of lead contamination in communities around the former Exide plant in Vernon. Brown laid out his $176.6 million plan in a letter to the chairs of the State Senate and Assembly budget and appropriations committees. In the letter Brown said the money “will be supported by a loan from the General Fund.” The loan would allow the Department of Toxic Substances Control to expedite the cleanup process around Exide and then the state will go after the contaminator for the money that was spent. If approved, the funds will be used to test up to 10,000 properties and clean up 2,500 to 3,000 of the most contaminated homes by the end of June 2017, according to the Department of Toxic Substances Control, which is overseeing the cleanup. Mark Lopez, who heads East Yard Communities for Environmental Justice, said Brown has finally heard their calls for his attention. Local and state officials had become more vocal in recent months, saying the cleanup of the expanded area was moving too slowly. Several compared the slow response to Exide to the quick response of the state to the natural gas leak in Porter Ranch, where Gov. Brown visited with residents. â€œWhile some of the toxic damage has already taken a toll on our communities, this funding will go a long way to restoring the safety and quality of life for the residents we represent,” he said in a statement. LA County Supervisor Hilda Solis said she was surprised and heartened by the news. She’s been meeting with residents for months in the impacted area and had got the county to commit some funds to help test. Several weeks ago she was in Sacramento asking the state for millions more. The governor’s proposal is “a great start,” said Liza Tucker of Consumer Watchdog, one of Exide’s and Toxic Substances Control’s fiercest critics. Barbara Lee, who heads Toxic Substances Control, said the money is going to help the agency determine where the lead came from. Solis and Tucker believed public outcry over the state’s different responses to Exide and Porter Ranch helped persuade Brown to act. “There shouldnâ€™t be two separate Americas in Southern California, one in Porter Ranch and one in East Los Angeles,” said Solis, who has been meeting with residents for months in the area around Exide. Toxic Substances Control said public criticism over the state’s handling of Exide did not factor into Brown’s initiative. Agency officials said they had been working on the funding proposal with the governorâ€™s office for months after it became clear the contamination area was much larger than originally thought. That was last August, when Toxic Substance Control said a much larger area than just right around the plant â€” up to a 1.7-mile radius around the former plant â€” needed to be tested. At that time crews had only tested 283 properties and cleaned five in the expanded zone. Up to 10,000 homes are within the perimeter of the zone, which includes East Los Angeles, Boyle Heights, Maywood and Commerce. Toxic Substances Control insists the cleanup is moving faster than required by law, butÂ community members have criticized the process as too slow. The agency has said it has $8.5 million to spend on testing and cleanup through the end of June 2017. It said last month it could test 15 percent of the expanded area and clean 50 of the most contaminated properties by the end of this June. Last month, SolisÂ called on the state to earmark $70 millionÂ in the new budget to test all the properties within one year and clean up those that need it. The state cleaned up 186 properties in the original assessment area, closer to the plant, but activists say the work on those homes is incomplete becauseÂ not all had their interiors professionally cleaned, and parkways â€” the strips of land between the sidewalk and the street -Â remain untested. Correction: An earlier version of this story misspelled Gov. Jerry Brown’s last name. KPCC regrets the error. The office of Governor Jerry Brown sent out aÂ press releaseÂ earlier today announcing his intention to â€œpursue an additional appropriationâ€ of $176.6 million for lead testing and clean-up in the 1.7-mile radius around Exide Technologiesâ€™Â now-shuttered lead-acid battery recycling facility in VernonÂ (seen above). Questions about the pace and scope of what could potentially be the largest toxic cleanup of its kind in state history have been popular topics with a number of news outlets lately. The rapid response to the methane gas leak at Porter Ranch â€” including the effort to relocate families until the leak could be plugged â€” contrasted dramatically with theÂ decades of inaction with which state and local agencies met working-class immigrant communitiesâ€™ complaints about Exideâ€™s toxic emissions and violations. The buzz around that discrepancy, DTSC Director Barbara Lee reassured reporters in a press call this afternoon, was not the reason that the governor was taking this rather major step now. â€œOne does not walk into the governorâ€™s office and say, â€˜Iâ€™d like $176 million’â€ without having done lots of careful background work on a proposal, she said. 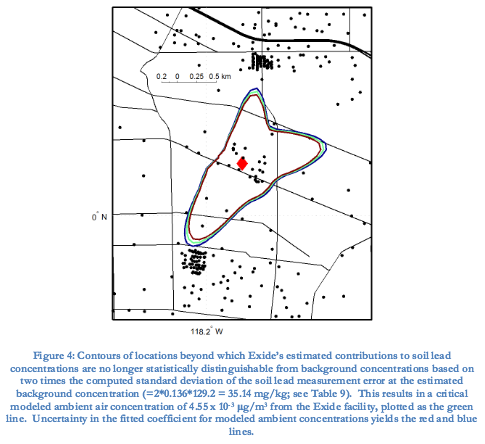 DTSC, she continued, had spent a few months assessing the costs incurred thus far in the cleanup process, estimating how many of the 10,000 properties within the 1.7-mile radius of the plant might need remediation, and, in response to community demands for economic investment in the area, calculating how funds could best be used to both benefit the local economy and secure a cleaner future for all. If made available quickly, Lee said, the funds would allow for 8500 properties to be tested within the next year (this is in addition to the funds already available to test the other 1500 properties). And they would allow for the cleanup of the 2500 residences, schools, parks, and daycare centers DTSC estimated could be contaminated enough to warrant remediation. Five of the seven parks and 16 of the 26 schools that fall within the 1.7-mile radius have been tested so far; the remainder should be tested later this spring. Parkways â€” the strips of grass between the sidewalk and the curb â€” unfortunately will not be tested as part of this effort. The priority, Lee reiterated, was to identify and remediate the areas children and pregnant women were most likely to come into contact with contaminated soil. Finally, Lee said, via the Hazardous Waste Reduction Initiative, DTSC would also be looking at the lead-acid batteries themselves to see how the manufacturing and handling of the batteries could be improved to lessen workersâ€™ exposure to lead. Similarly, she continued, DTSC would also look at how the life-cycle of the batteries could be improved as well as potential alternatives that would make them safer altogether. Should the analysis result in lead batteries being identified as a â€œPriority Productâ€ under the Safer Consumer Products program, manufacturers would be required evaluate the productâ€™s health impacts and consider ways to reduce them. â€œItâ€™s very forward-lookingâ€ Lee said of the plan. Graphic from the report produced by Drs. Small and Rose on behalf of Exide. Exide claims its lead footprint is minimal, extending only to the uninhabited areas within a short distance of the plant. The areas of concentrated black squares are the initial assessment areas, where it was found that nearly every property needed remediation. Lee said that the DTSC had been consulting regularly with the U.S. Environmental Protection Agency about logistics of such massive cleanups and things that the DTSC would need to make sure to take into consideration. Even with that help, it is hard to balance such a massive scale with the very real legwork that needs to be done on the ground in working-class immigrant communities. Many residents in the area are still under- or misinformed about Exide and the impacts its emissions could have on their health; others may know nothing about the existence of Exide at all. Sending out notices by mail generally doesnâ€™t work. And if the people doing the door-knocking to inform them about potential health risks or opportunities to have their yards tested for lead donâ€™t know how to engage them properly, then that method wonâ€™t be much use, either. Ana MascareÃ±as, Assistant Director of Environmental Justice at DTSC, said that DTSC was currently partnering with community-based organizations on two pilot projects to do local engagement. Should those prove successful, she said, they would look to partner with more local organizations in order to expand their efforts and scale up their outreach. They are also considering setting up a central community resource center as well as being involved in more local events like health fairs in order to be able to do more blood-lead testing and other screenings. With regard to health issues, there is no plan as yet to do a systematic study of the impact of Exideâ€™s toxic emissions on the community. It is not something they have excluded from consideration, I was told by Lee during the press call, who said that they regularly consulted with the Department of Public Health and other health agencies. But their current efforts were directed at prioritizing ensuring cleanups were underway. The appropriation of these funds, Lee concluded in her opening remarks to reporters, shows how important this case is to Governor Brown. Those that called for Exide to be shut down years before Brown even came into office in 2011 might beg to differ on that point. AndÂ young activists from East Yard Communities from Environmental Justice are not so sure that Brownâ€™s proposal to expedite the process by exempting it from the California Environmental Quality ActÂ is wise, fearing it could lead to an incomplete or even harmful cleanup down the line. But they are pleased that the plan responds to their demands to see economic empowerment and revitalization be tied to environmental restoration. All that remains is for the money to actually be disbursed. The funds, Lee told reporters, are for this fiscal year, and could be made available in their entirety before the next fiscal year begins. We have done extensive coverage on Exideâ€™s confounding and often confusing case here at SBLA. If you would like to know more about the draft environmental impact report regarding Exideâ€™s closure plan, please clickÂ here. If youâ€™d like to know more about the closure process, the lead testing process and challenge of linking Exide to the lead contamination, please clickÂ here. 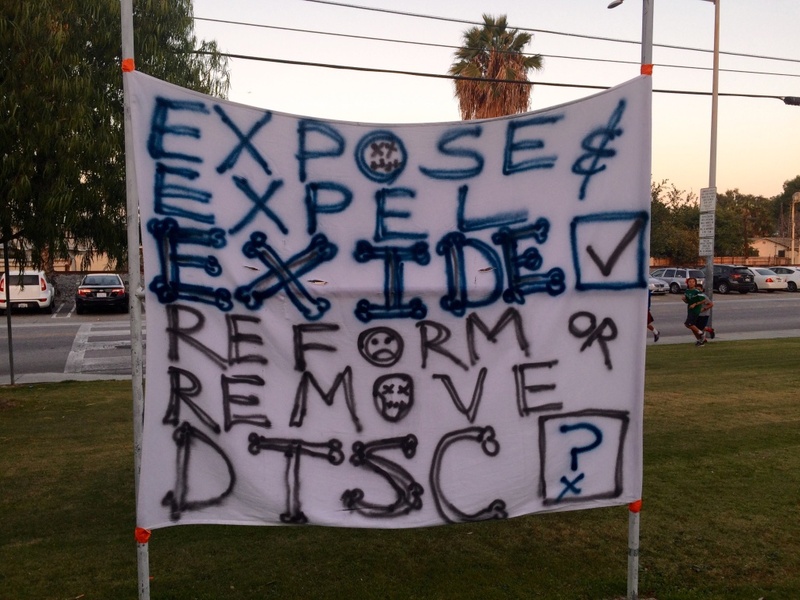 If youâ€™d like to learn about why the community is adamant that state agencies be held accountable for allowing Exide to commit as many environmental crimes as it did, please seeÂ here,Â here,Â here, andÂ here. If youâ€™d like to know more about why the plant was shut down, please seeÂ here,Â here,Â here,Â here,Â here, andÂ here.